Opera Pro Cantanti presents "La Traviata" by Giuseppe Verdi. Violetta struggles as she is consoled by Alfredo and Germont. Violetta - Julie Duerichen, Alfredo - Derek Bacchioni, Germont - Richard Williams, Annina - Stephanie Manchulenko, Doctor - Zac Cocciolo. 1. 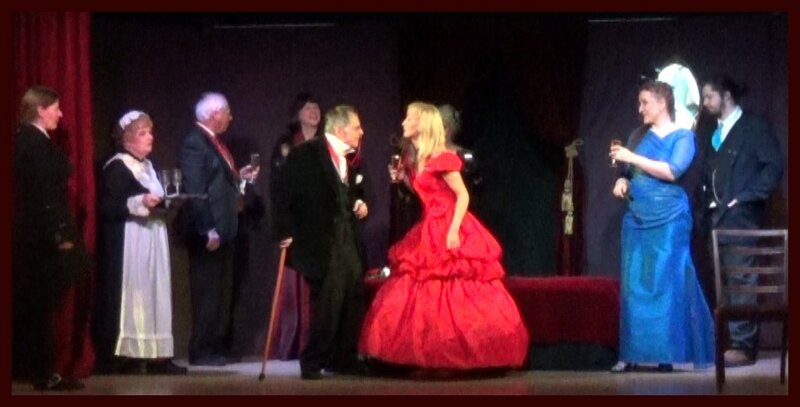 Scene from Opera Pro Cantanti's production of "La Traviata" by Giuseppe Verdi. Alfredo is asking Violetta's maid Annina where she has gone. Annina replys that Violetta has gone to Paris. 2. Violetta gives Annina a Message to give to Alfredo. 3. Annin hands the letter to Alfredo. Stephanie as Violetta's maid and companion, Annina, in the final Act of Verdi's "La Traviata" Violetta played by Emily MacKinnon and Alfredo played by Mark Pepe. Annina tries to help Violetta on with a garment as she is dying of Tuberculosis. She is elated that Alfredo has finally arrived after a long absence and really still does love her. Scene from Opera Pro Cantanti's production of "La Traviata" by Giuseppe Verdi. Annina enters to announce that Alfredo has returned but alas it is too late. Violetta is near death but seems to revive upon seeing Alfredo as he enters the room and the two of them two embrace. Major operas performed by Opera Pro Cantanti are: Verdi's "La Traviata", "Macbeth", and "Rigoletto", and Bellini's "Norma". "I Capuleti e i Montecchi"; Bellini's operatic re-telling of the Romeo and Juliet and "Nabucco" by Verdi. Performances are held most Sunday nights as well as some Monday nights at 7:00p.m. with doors opening at 6:30p.m. and 3:00p.m.at the Cambrian Hall, 215 East 17th Ave. Vancouver. The theatre entrance is one door off Main Street. Please call ahead or check the website for schedule changes.